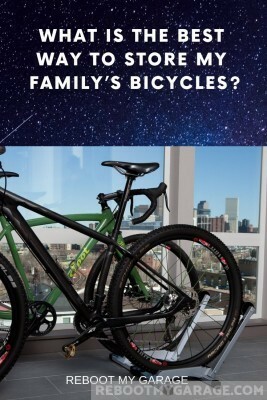 What is the Best Way to Store My Family's Bicycles? 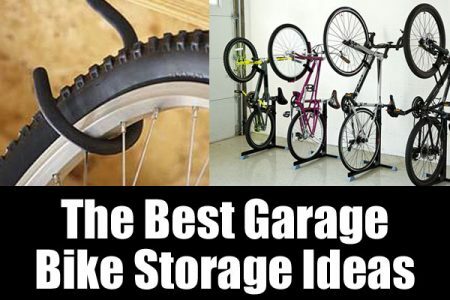 Bikes can take up a huge amount of garage floor space. 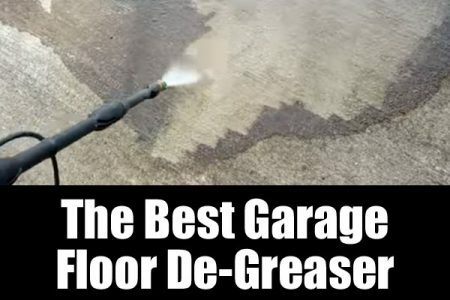 If you have little ones, then kickstands on the garage floor might work best for your family. But maybe you’d like to get the bikes off of the floor to re-claim that space. 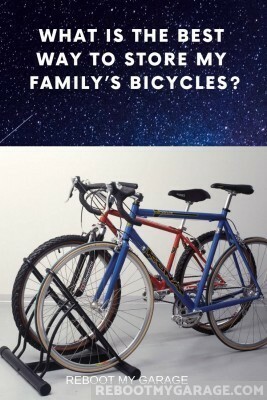 What’s the best way to store your family’s bicycles? 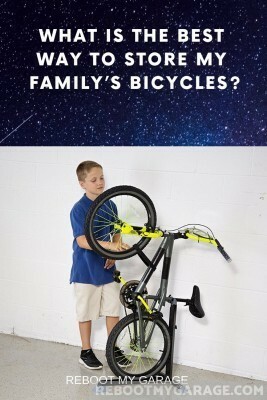 The best family bike storage depends on your kids’ ages. Store bikes on the garage floor using kickstands or floor stands. Store bikes on the wall using wall racks. Store bikes on the ceiling using a hoist or an elevator. Store bikes outside using bike covers. Or, store bikes in a shed. Mix up the methods to maximize space. What are Your Bike Storage Goals? 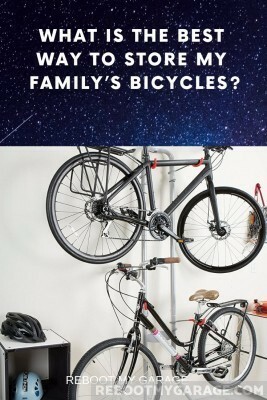 What is the Best Bike Storage for Families? Some bike storage methods won’t work if your bike has the wrong sized tires for the bike organizer. Fenders and disc brakes can also get in the way. Inventory your bikes’ dimensions. Record tire widths. Note if bikes have fenders or disc brakes. Check that the solution you want will work with your bikes’ features. When I refer to smaller kids’ bikes, I mean any tire up to 2.3 in. wide. For adult bikes, tire width is 1.9 in. to 2.6 in. “Fat tire” widths are 2.8 in. to 4 in. Disc brakes make the wheel hub wider than normal. Some solutions will work for your tire’s diameter and width, but not for the disc assembly mounted on the hub. Check that the solution you want will work with your bikes’ disc brakes. Fenders add to the bike tire diameter. 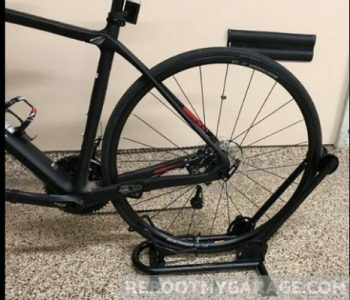 A bike tire that fits a wall mount or floor mount might not accept the fender too. 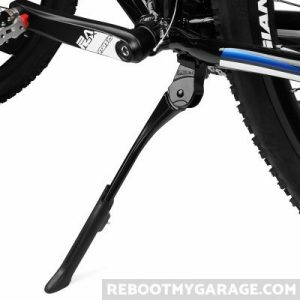 Check if your bikes’ fenders will work with the solution you want to buy. 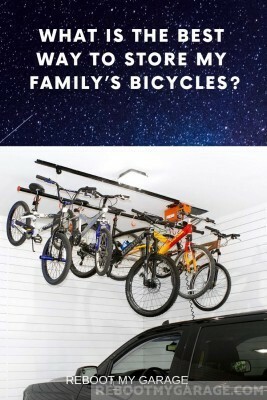 How much garage space do you want to devote to your family’s bike storage? Do children need floor-level access to their bicycles? Kickstands and floor stands use lots of garage floor space, but give children easy access to their bikes. 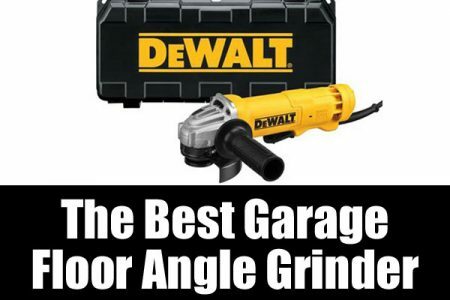 Wall stands might work for older kids, and buy you back some of your garage floor. 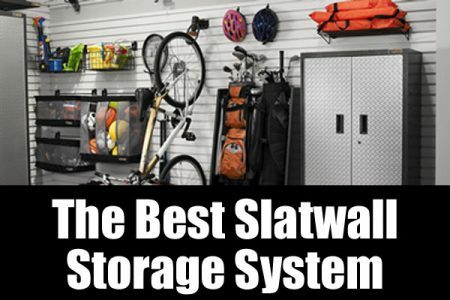 The best family bike storage organizers for your family will give you the garage floor space you need, while sacrificing the least amount of convenience. 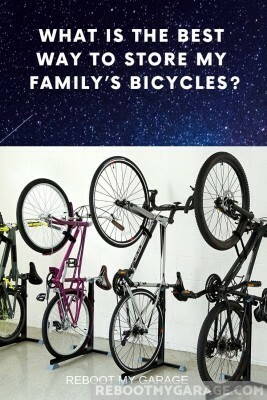 The best bike storage depends on whether you need to save garage floor space, and whether you have smaller kids. Store bikes in the garage using kickstands, horizontal floor stands or vertical floor stands. Kickstands: Attached to the bike itself. The bikes take up garage floor space. Easiest for children to use. .
Horizontal Floor Stands: Always on the floor. The bikes take up garage floor space. Mostly easy for children to use. Vertical Floor Stands: One tire is always on the floor. Bikes take up less garage space. Not easy for children to use. 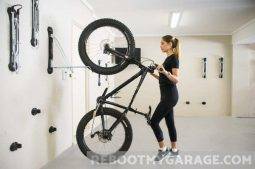 Mount bikes on the garage wall using wall racks or hooks. 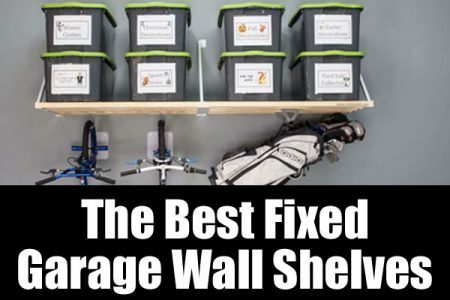 Wall Racks: Bikes are off the floor but protrude into the garage space. Some racks store the bikes at a 45 deg. angle from the wall, which saves some garage space. Bike racks are too hard for smaller children to use. 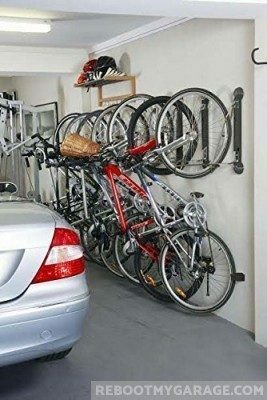 Wall Hooks: Bikes are off the floor but protrude into garage space. 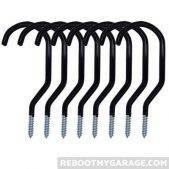 Some hooks allow you to store the bike flat against the wall, which saves a lot of garage floor space. Wall hooks are not good for smaller children. Store bikes near the ceiling using pulleys, platform lifts (elevator lifts), winches or ceiling hooks. Manual Hoist Pulleys: Bikes are off the floor. You still need space to lower the pulley. Pulleys are too hard for smaller children to use. Elevator Lifts: Bikes are off the floor, but you must reserve the space under the lift for when the lift is down. Elevator lifts are too hard for smaller children to use. Winches: You can use a generic winch to pull bikes off the floor. You need to reserve space under the bikes to retrieve them. Winches are not for smaller children. 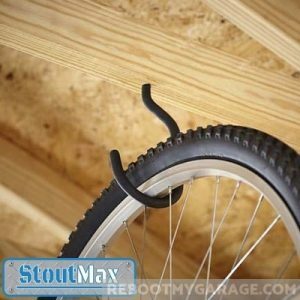 Ceiling Hooks: Hang the bike by a tire on a ceiling hook. Reserve space under the bikes to retrieve them. Ceiling hooks are not for children. They might not be good for your bike tire. Store bikes outside of the garage altogether using bike covers and bike sheds. Bike Covers: No garage space is used. Bikes are outside. You must also use kickstands or floor stands to hold the bikes upright under the cover. Whether a child can maneuver the cover will depend on the child and the cover design. Bike covers can be thief magnets, so lock your bikes if this is your situation. Bicycle Shed: No garage space is used. Bikes are in another structure. You must also use kickstands or floor stands to hold the bikes upright. Little children can do very well with kickstand bikes in bike sheds. 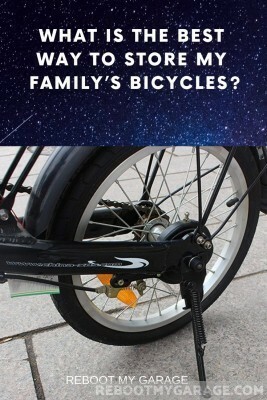 Kickstands are the easiest solution for smaller children’s bikes. A kid who can ride a bike can also operate a kickstand. If you want your little ones to put their own bikes away, then kickstands are the best solution. But a bike on the floor is a bike taking up valuable garage floor real estate. If this is a concern, how about storing the bike on a kickstand but under a cover or in a shed? One solution is to mix bike organization solutions. 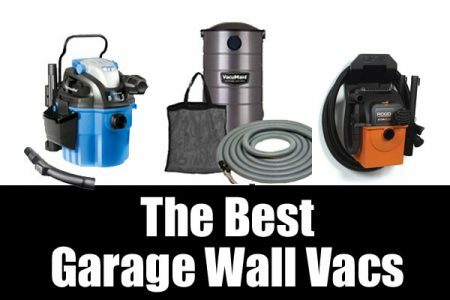 Give smaller kids more garage floor space, and bigger kids garage wall or ceiling space. 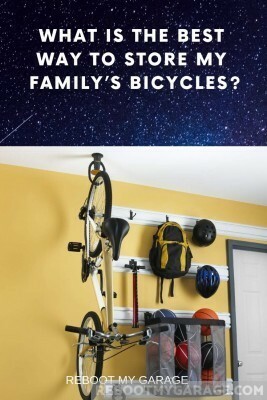 Or, get all of the kids’ bikes off the garage floor, but then the bigger kids or adults will have both get and put away the bikes for the smaller kids. 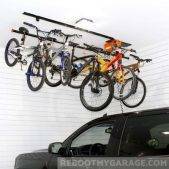 If you want to save space, you can put bikes on the wall or ceiling. Learn more about off-floor bike organization below. 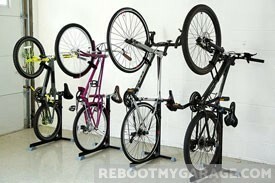 I think of kickstand and floor stand storage as “horizontal bike storage.” With horizontal organization, both bike tires stay on the floor. 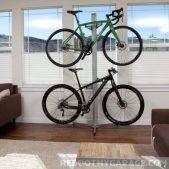 Some floor stands and all wall racks are “vertical bike storage.” With vertical storage, one or both tires is above the floor. Generally, smaller kids need horizontal bike storage. 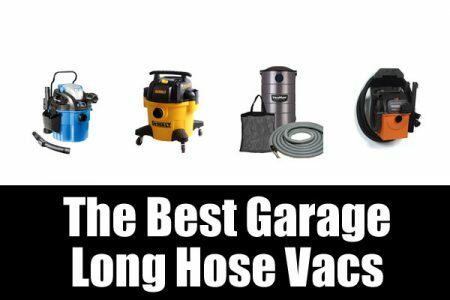 Bigger kids can handle vertical solutions that save garage floor space. Anything that requires you lift the bike to store it is not going to work with little kids. 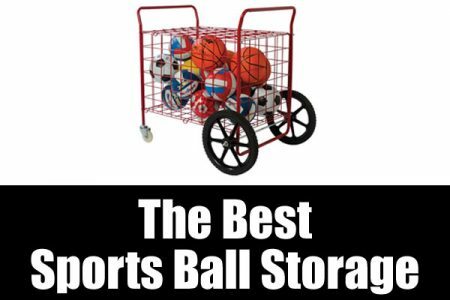 Plus, not all wall storage works for children’s size bicycle tires. 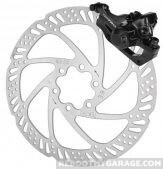 You’ll also need to look out for disc breaks and wheel fenders when sizing up floor stands and wall racks. 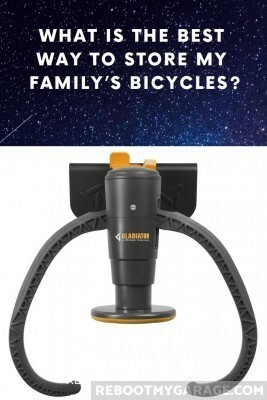 Compare bike stands against your family’s bicycle measurements, fenders and brakes. 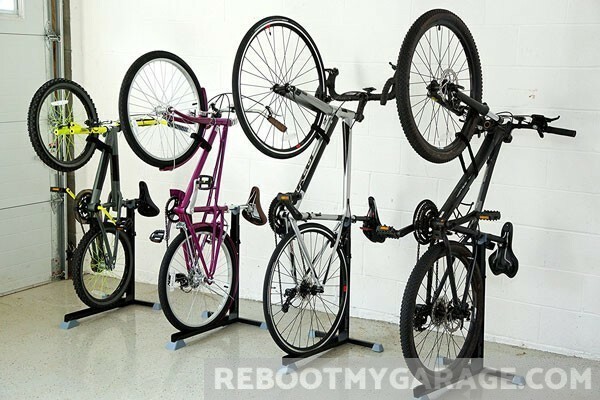 If re-claiming garage floor space is not a goal, then put a kickstand on everyone’s bikes. 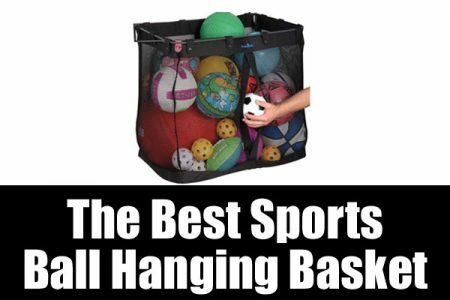 It’s the most convenient solution for adults (aside from a floor stand). 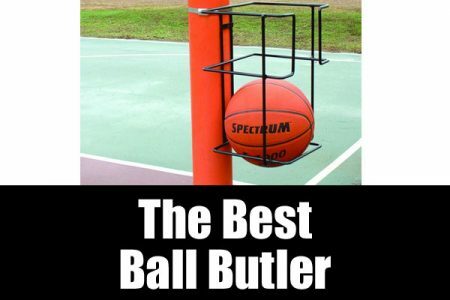 It’s the easiest for smaller kids to use. Kickstands are cost-effective. They come in handy when parking the bike away from the home. Horizontal Floor Stand for older kids: Bike Nook Floor Stand (recommended)Some floor stands are more convenient than kickstands. You put the front tire in the stand to keep the bike upright. Some floor stands allow both tires to stay on the floor. I call these “horizontal” floor stands. Vertical floor stands hold bikes in mid air. Horizontal floor stands take up just a little bit more garage floor space as kickstands. Vertical floor stands also take up about the same space as kickstands. When you put your bikes on vertical stands, your bikes are still in your way. It’s just that one tire is on the floor and one is in the air. You need to leave space to retrieve the bikes from the floor stands. Smaller children do well with horizontal bike stands. Older kids and adults can use vertical floor stands. 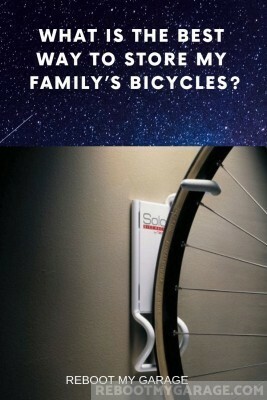 Wall racks allow you to place your bicycle on the wall. Some wall racks hang your bike vertically. You pivot the bike onto its back wheel. 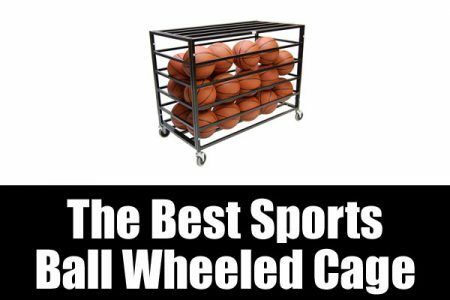 You put the front wheel into the rack. The Steadyrack is a good example. After you place the front wheel into its slot, you can pivot the bike to lie flat against the wall. Now the bike is not sticking out into the room. The Stalwart FLIP UP Bike Rack is a horizontal wall rack. You lift your bike frame onto the rubber-coated hooks. The bike sits horizontally a few inches from the wall. 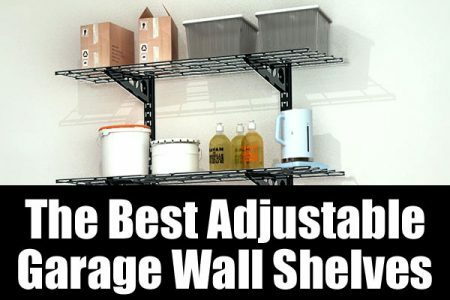 Wall Racks do help save garage floor space, but they also reduce convenience. Bicycle wall storage is too difficult for little kids. Older kids can handle it. Some bike racks do try to save garage floor space. When the bike sticks into the room, it’s sticking out over the floor, too. The flatter the bike is against the wall, the more garage floor space it saves. Models that store the bike against the wall are better at saving floor space. Caveat: Always mount bike racks in studs, not drywall. Bike hooks are simplified wall racks. Good bike hooks have strong screws built into one end. The other end is a wide, deep, curved hook. (Deep is a relative term. Most bike hooks are not deep enough to store ladder platforms.) Bike hooks usually come with rubber coating to protects your bike’s finish. Always mount bike hooks into wall studs, not drywall. 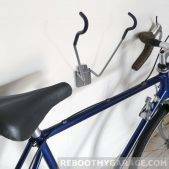 Bike hooks can allow you to store bikes horizontally and flat against a wall. 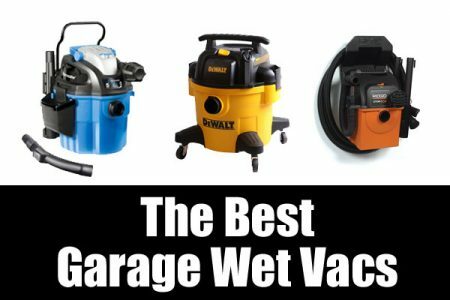 This saves garage floor space. 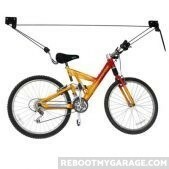 You would mount two parallel hooks, then lift the bike frame onto the hooks. Another option is to hang the bike vertically. Hang the front tire on a hook. Let the bike hang from just this one tire. 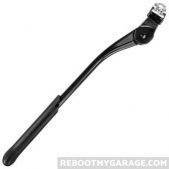 Do look for a hook that’s wide enough for your bikes’ tire widths. 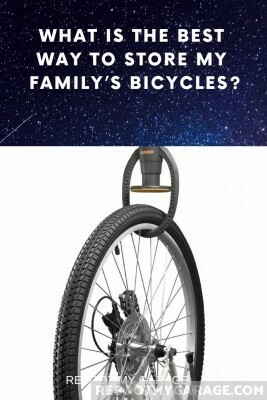 Also take into account the bicycles’ disc breaks and fenders. 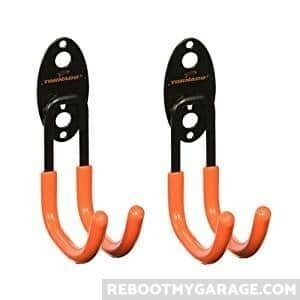 I’ve reviewed a number of bicycle hooks and found that many bike hooks have rubber issues. The rubber coating comes off after a few uses. Note that bike hooks aren’t a good solution for smaller kids. You have to lift the bikes onto the hooks. But they do save garage floor space when bike hooks hang your bikes against the wall. Caveat: Always mount bike hooks in studs, not drywall. 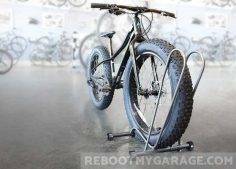 Caveat: Putting all of the weight on one bike tire might bend the rim. Updated Feb. 20 2019: None of the bike pulleys reviewed (below) are safe enough to buy. 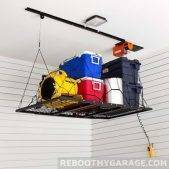 The only manual pulley I’d recommend for bicycle ceiling storage is the Store Your Board Hi-Loft ladder pulley. It’s well-constructed and safely engineered. Wrap the straps around the bike frame. You will get two points of contact to balance the bike as it rises to the ceiling. A pulley is a lift that hoists the bike into the air. 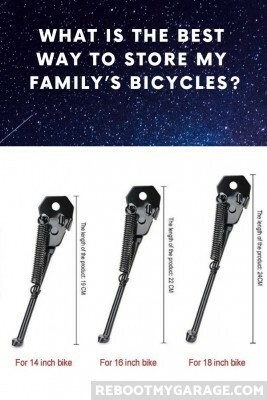 Bike pulleys give you a pair of hooks to balance the bike before lifting. Pulleys work like window shade cords. Pull the rope to make it go up. Let go of the rope to make it come down. 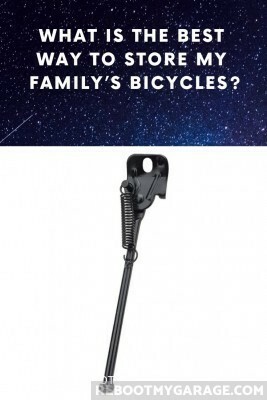 To use a bike pulley, hook the bike’s seat and handlebar. Each lift carries one bike. Good pulleys are easy to use. They’re cost-effective. 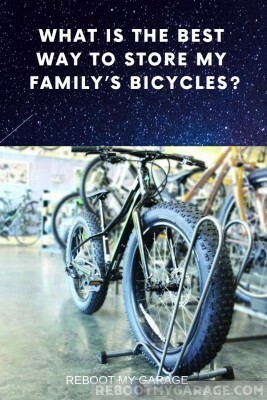 And they work for all bike sizes, including those with disc breaks and fenders. But, good pulleys are impossible to find. 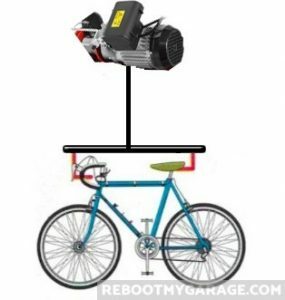 You would have to make your own with a good winch (see below for more on bike winches). Bike pulleys would be an effective space saver if there were any worth buying. 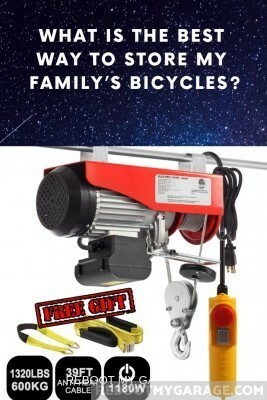 Bike pulley manufacturers have cheapened a good idea. All bike pulleys I reviewed had weak ropes. 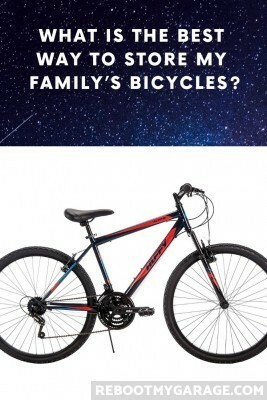 There are no bike pulleys in the product recommendations. Although it’s a good concept, none of the manufacturers invest in their offers. Wide hooks are a common problem. The hooks don’t stay under the handlebars and bike seat. The hooks can’t hold the bikes in the air. Many customers report that ropes fray, or come loose from the pulley tracks. 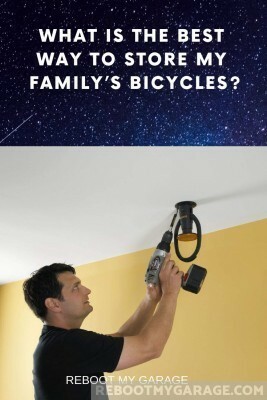 Putting bikes over your family’s heads should be safe. When a high-quality pulley comes out, I’ll let you know. And, of course, pulleys are not good solution for little kids. Interstellar and Sunlite don’t have enough history to judge their quality. Outright rejected brands include RAD, Racor, MVPower and Cartman. Update: Found a high-quality bike pulley. Unfortunately, there’s only a used one in stock and none that are new. If your luck changes on that score, here’s the link to the high-quality Floaterhoist BA1 Bike Hoist. Update Feb. 20, 2019: I’m not recommending any bicycle-dedicated motorized lifts. In my opinion they should be OVER engineered for safety. What I do like is the Partsam garage winch. 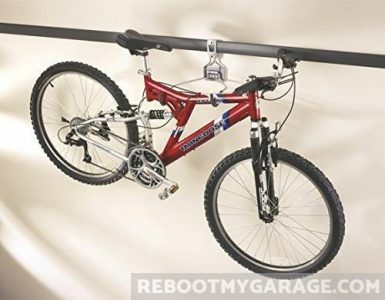 attach a bar to the winch hook, then attach the bicycle to the bar. 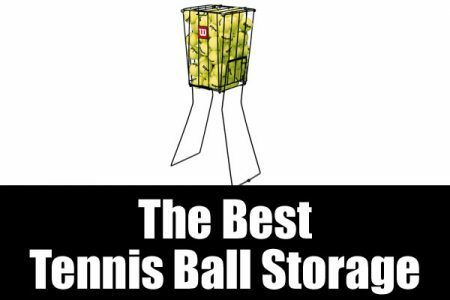 Stability and safety are absolute requirements in any ceiling storage solution! 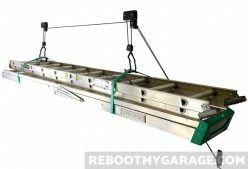 A motorized bike lift combines a ceiling winch and hooks. You mount the hooks onto the bike’s frame. The winch pulls the bike up to the ceiling. 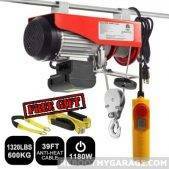 Most winches modified into “bike lifts” are not worth buying. 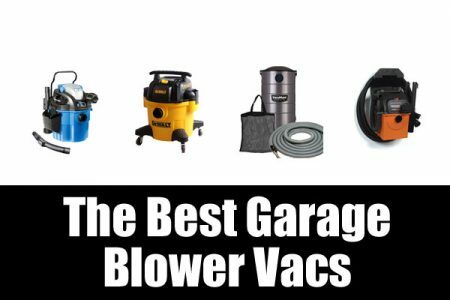 They have the same engineering and quality issues that the manual pulleys have. Update December 28, 2018: The Proslat Garage Gator Bike Lift is no longer recommended. It’s hard to assemble and it’s not well engineered. One exception is Proslat’s Garage Gator Bike Lift. You can lift 4 bikes or 8 bikes on the Garage Gator winch. Two wires hold a horizontal bar. The bar holds the hooks. The hooks hold the bikes. You plugin the system into a standard electrical outlet. 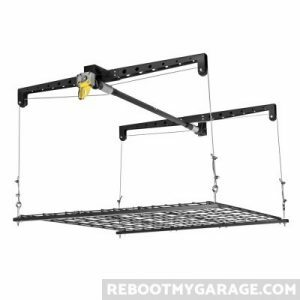 The Garage Gator Bike Lift is a variation of the Garage Gator Motorized Platform Lift. The engineering design is the same. That system has a good reputation with no safety complaints as well. Really important to read the instructions! Storage bar expands from 6 to 9 ft.
Ceiling hooks are the ceiling version of the bike hooks we discussed above. They are rubber-coated, wide mouth hooks. The screw end goes into a joist. The mouth accepts a tire. 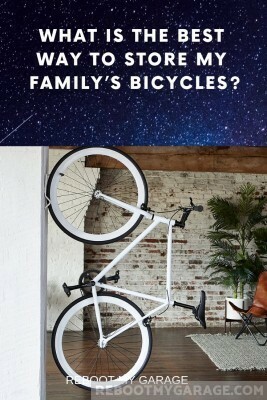 The bike hangs vertically from the ceiling. Hooks don’t work on tall ceilings if the height makes it too hard to put away and retrieve the bike. It can be too hard to reach. Even with lower ceilings, it can be awkward to hook a bike over your head. And ceiling hooks are not best for kids. 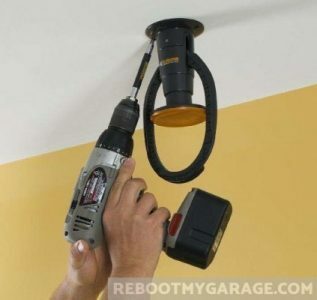 Ceiling hooks are good at saving garage floor space. The rubber-coated hooks are a cost-effective ceiling hook solution. 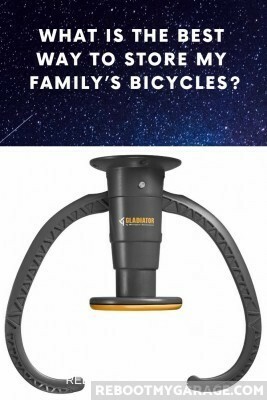 One of the few bike hooks I like is the Gladiator Advanced Bike “Claw.” It’s well-engineered and is made with quality manufacturing. The Claw supports 50 lb. 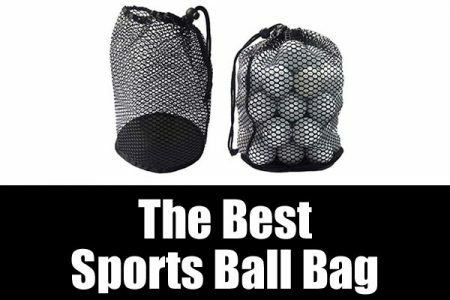 It’s one of the most popular Gladiator products. 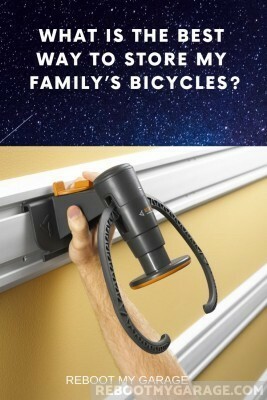 Richohome makes a really simple and cost-effective ceiling bike hook. It holds bike tires up to 2.5 in. wide. You get several hooks per pack, and they each hold up to 100 lb. Each hook is vinyl coated to protect the tire rim. Update December 28, 2018: Garage Gator Lift is no longer recommended. 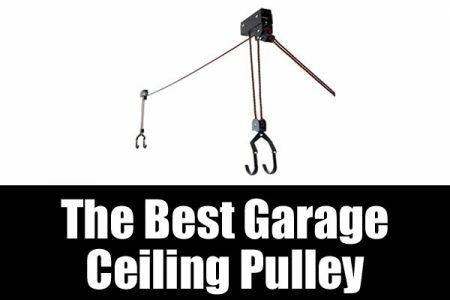 A garage elevator is a platform attached to a ceiling winch. You press the control to send it up and down. Consumer models plug into stand electrical outlets. Many elevator lifts are too dangerous to recommend. I found only one brand worth considering. 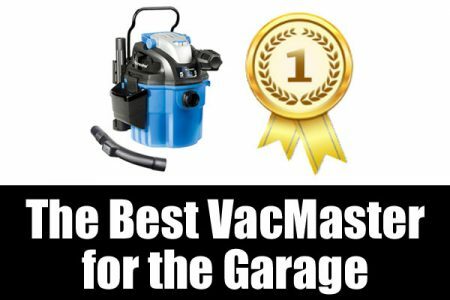 It’s from Garage Gator, which is a Proslat brand. 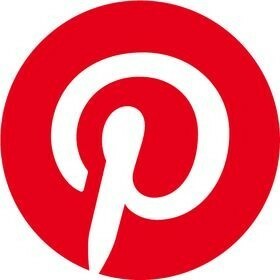 See the product recommendations at the end of the article. Platform lifts come in 4 ft. x 4 ft. and 3 ft. x 6 ft. sizes. The Garage Gator is 4 x 4. Most adult bikes are longer than 4 ft. But as long as the axles are on the platform, the bike ends can hang over the platform edges. Kids’ bikes will fit well. Elevator lifts are a cool solution. Little kids might be comfortable with them. You’ll probably get 3 bikes on a 4 ft. platform. 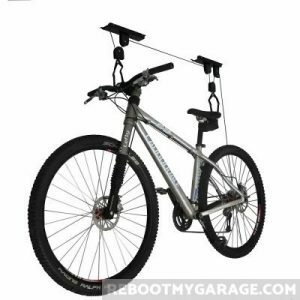 Rather than getting a specialized bike storage solution, you can hang your bikes from a generic motorized winch. Without adding your own adjustments, each winch would only hold one bike. 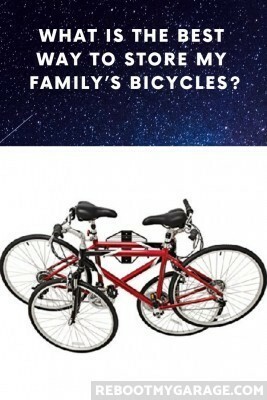 Bikes are prone to get unbalanced. Hang a horizontal bar from the winch; and hang the bike from two points on the bar. 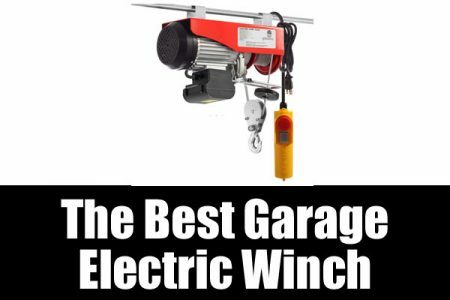 Many winches are not worth buying. They have dangerous quality-control issues. I looked at about a dozen winches. I finally found the highly-rated and respected Partsam winch, which I recommend. The Partsam winch has an automatic shutoff when it reached its max height. It also shuts off if its cable twists. This is something I’d like to see standard on all winches (and pulleys). 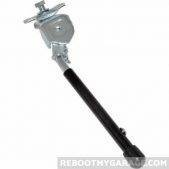 The Partsam can lift 1310 lb. Little kids should not use a winch. 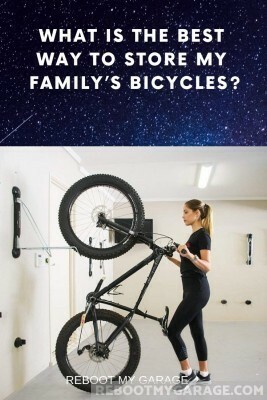 But it does get the bikes off of the floor! You can store bikes outside under a bike cover or in a shed. 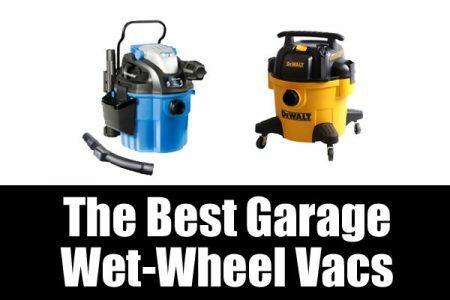 Both get your family’s bikes off of your garage floor. Little kids might be able to use covers and sheds. It will depend on the setup and the kid’s abilities. I gave the highest rating to a bike cover, and then realized it was meant only for adult bikes, not for kids’ smaller bikes. So I found a second cover with similar qualities for kids’ bikes. 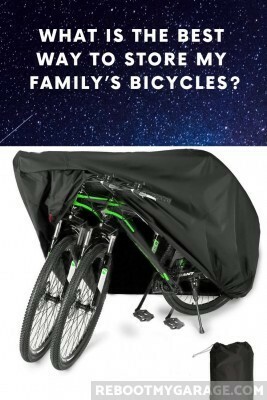 A bike cover is a specially-formed tarp the sits over and tucks under your bikes. It’s a bike raincoat. 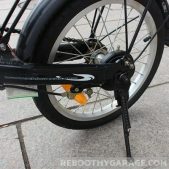 Many bike covers have lock cable pass-through’s. But a locked bike cover isn’t as secure as a locked garage. 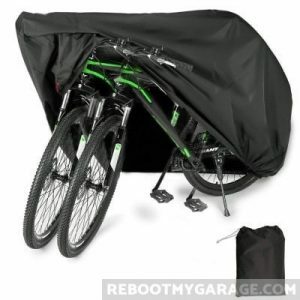 Good bike covers protect bikes from rain, snow and wind. Covers can be too much for small children to use. If you use a bike cover solution, you might have to put bikes away for the little ones. A good cover is sturdy, durable and weatherproof. It should be UV coated. I recommend the EUGO cover. 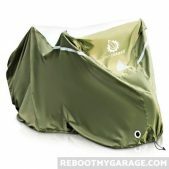 For kids’ bike storage, I recommend the YardStash Bike Cover. Use it to protect two bikes. The best thing about a bike shed is that it’s not the garage. 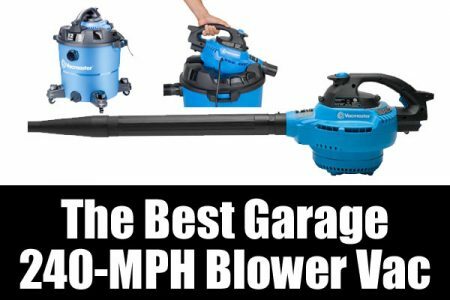 Getting the bikes into their own secure and weather-protected shed can free up a ton of garage space. Shed dimensions determine how many bikes the shed will hold. Tall, narrow sheds can get annoying. It helps to install a wall mount rack in the shed. This will keep the bikes steady when storing and removing. In a wider shed, use kickstands or a floor rack. Unless you are willing to pull the bikes from the back, you need to leave space next to the bikes. Imagine storing and removing the bikes in the space allowed. Will you feel crowded? Will you hit your ankle when trying to get your bike out? Will the children be comfortable getting their bikes in the space allotted? Other bikes might get in the way. One of the best ways to use a bike shed is to equip it with a a vertical wall bike rack. 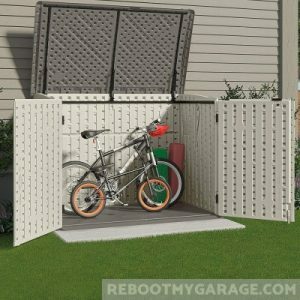 This allows you to use the shed wall, and let’s riders get closer to their bikes when retrieving them and storing them. 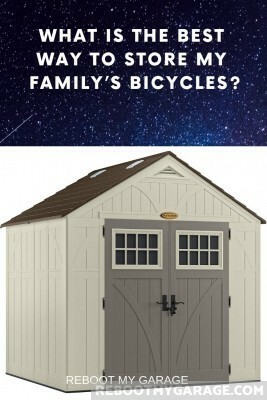 Sheds make bikes accessible while protecting them from theft and weather. A really large shed is like a garage. You just need kickstands or floor stands. 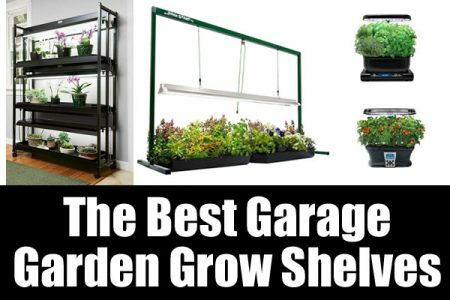 But for a smaller shed, only a taller shed with wall mounts makes sense. 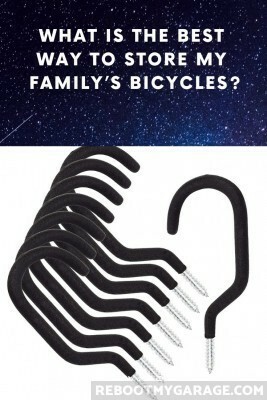 This will make everyone’s bike easy to unrack. Leave the little kids’ bikes on the floor using kickstands or floor stands. I looked at over twenty sheds and decided that one of the best bike sheds is the Suncast Tremont shed. It’s a sturdy bike home that weathers really well even in the hot sun. The door is 5 ft. wide by 6 ft. tall so there’s no problem getting bikes in and out. The shed floor is 8 ft. x 7 ft. leaving you a ton of room to park your bikes. It’s relatively easy to assemble by pushing and locking the blow-moulded parts together. Just be sure the surface spot is very, very flat. Consider putting down 12 in. x 12 in. cement patio blocks where the shed will live. The Tremont shed is hands down one of the nicest bike sheds you can buy. It’s attractive, holds up to weather, and you can secure it with a good padlock. Check out the latest price on Amazon. 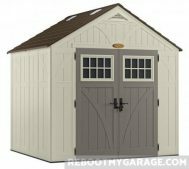 Shed is 8 ft. x 7 ft.
Is it OK to store a bike outside? Temperature changes can create condensation (water) on your bike, which can lead to rim rust. If you store your bike outside, check it often for moisture. Wipe it down until it’s completely dry. 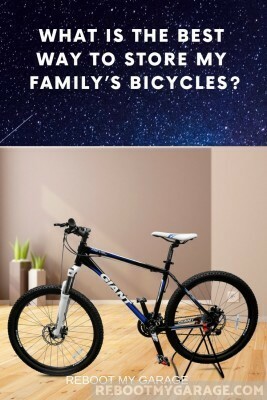 How do I size a bicycle for me or my child? Bike Guider wrote an excellent tutorial you should read!